If you have followed my blog for a while you probably know that I’m on and off is working on my own fantasy setting, the Etrakien world. The world is mainly concentrating on the area around Ankh-Bathor, the world’s largest city and market place, dividing the world between east and west. Earlier I’ve made two versions of the map for this world, but some maps just don’t seem to have a last version, so I’m now restarting the map for a third time. Why you might wonder, well the reason is actually quite simple. Since the world is developing all the time with twists and turns the map in the end didn’t really work out with the plot. The biggest reason for this is that it felt like everything was too far away from each other, I wanted the world to be more concentrated to one are. This would open up some new possibilities in my world building, and making a new map is never something bad, that is always good. 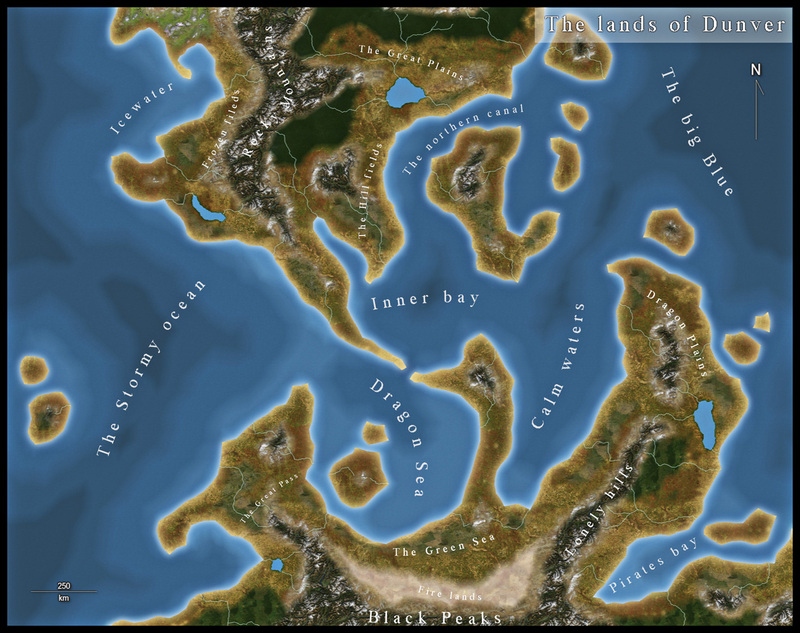 As you can see in the sketch of the world above I’ve kept quite a lot from the older maps, actually most of the coast lines are from the earlier ones, they have only been moved around quite a lot. I also decided to have less countries then before, mainly because this will make it easier to keep track of the politics of the world. Instead I’m adding some free city states that are under their own rule, but will be in coalition with one or more countries. I’m in no hurry to finish this map, and it is something I’m working on between commissions and some other stuff, so there might be some time between updates. But it will be a fun project to work on. 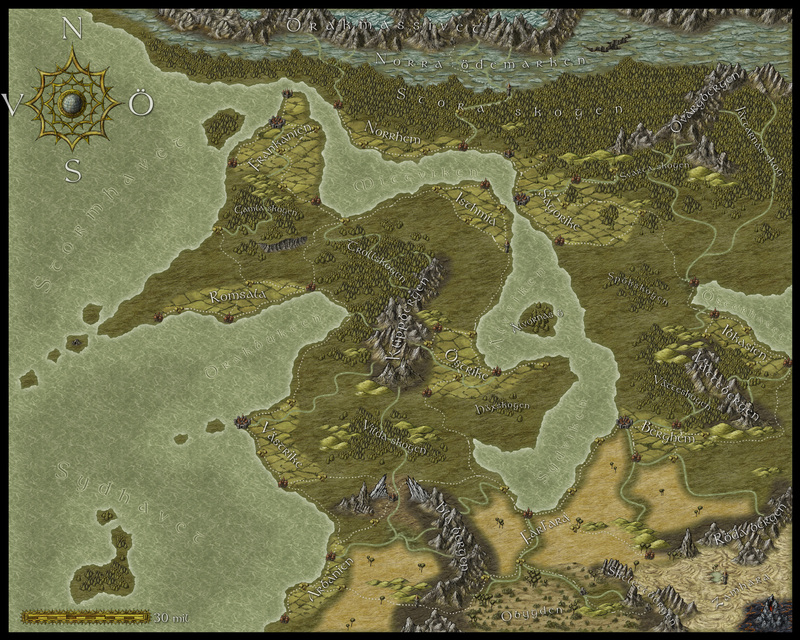 This month’s annual for Campaign cartographer 3 from Profantasy offered a very good looking style based on the world map of the upcoming role-playing game the “13th Age” by Rob Heinsoo and Jonathan Tweet. I always like to try out new styles so I thought I should give this one a try too. Usually when I make maps I try to make a story around it. If you let the map visualize your story it is often easier to make it more unique and the details will kind of come more naturally. 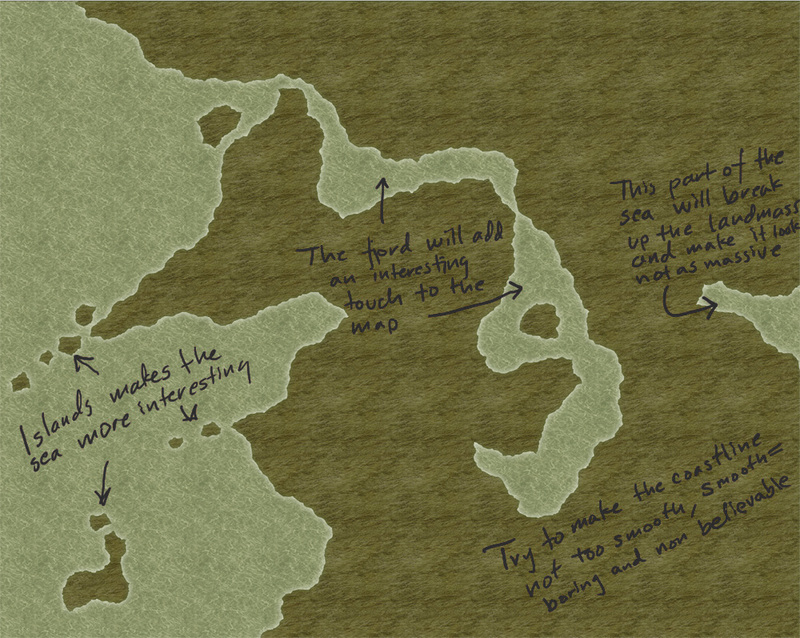 The drawback of working in that way is that it takes much more energy from you making a map, so this time I decided to just make a map without weaving a story around it. The style itself was very easy and quick to work with. Most of the terrain is made up from seamless bitmap files so making mountains and other types of terrain goes really quick. The mountains however gave me some problems. Sometimes it was hard to get the high peaks in the places where you wanted them. But luckily enough the style also includes single mountains you can add to the mountain texture, which made the process easier. If you look at the map included in this post I guess it took around three hours to do it, and then I probably spent as much time on labeling as I did on the actual map. One thing I didn’t like though was that when you added the sheet effects to the map the seas didn’t get any effect added to them. When I made the map I had two larger seas, the sea of pain and little sea, that where close to the oceans. When those seas didn’t get any effect they looked strange compared to the nearby oceans. I tried to add some effects to the sea layer but because the ocean layer lies below the land layer and the seas are on top of the land layer it was hard to get an effect that looked exactly the same. Apart from that I liked the style and if you want a map in a more stylish satellite style I can really recommend it. I’m a big fan of MS Visio. It is a great program that I’m using a lot at work to make pictures that explain my work environment in a clear and easy way. I was also lucky enough to be able to buy the program for a low price to use at home. But now you might start to think what this has to do with mapping, quite a lot actually. Visio is a great tool even for mapping, but not mapping in the traditional way. Even though you actually can do great maps of offices in it, maps that in style could be great as blue prints in a game that takes place in the modern world. But I’m more interested in making fantasy maps, so how am I using Visio here. Well so far I’ve mainly used it to map the relations between nations and factions. With it you can make great maps that give you a good look of how the different nations correspond to each other. 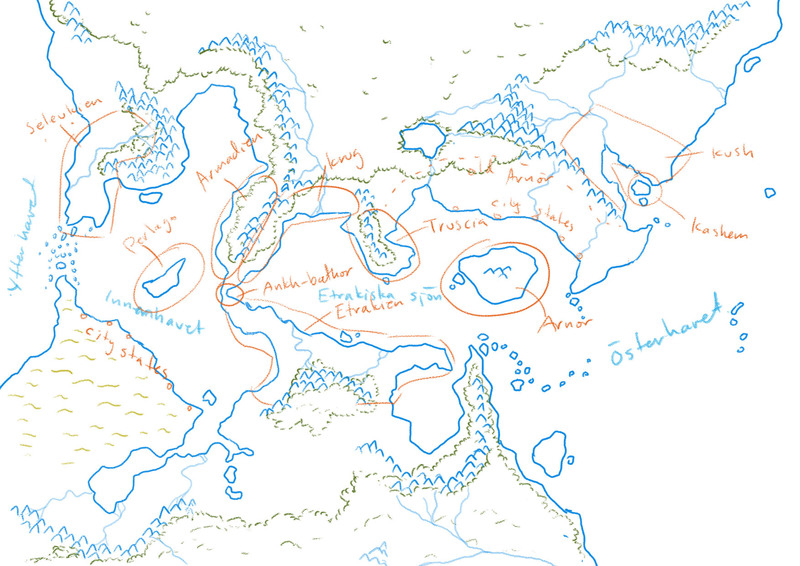 As an example I’ll show you the “relation” map of the Etrakien world below. When I started to create my Etrakien world the main thing I was clear about was that there had been two empires that collided and in the end brought themselves to a collapse. After that the world was divided into a lot more countries then before. In the beginning I only had the name of a few but as I started to map the world I had to make up some more. So now I have fifteen countries around the Etrakien sea, countries that in one way or another have to relate to each other. I knew that The Etrakien Empire and the Arnorian Empire hated each other, and still theoretically were at war, and that the Etrakien Empire wanted to reconquer Ankh-Bathor. But what about the rest of the countries, who were they friends or enemies with? So I decided to make a simple map in Visio to get my ideas and thoughts on paper. In the map you can see the relations between countries with colourful arrows. If there is no arrow between two countries that means that they are neutral to each other. I started to put in the two obvious ones, the red arrow between Etrakien and Arnor and the orange one between Etrakien and Ankh-bathor. I then started to think what I would have done if I were Ankh Bathor, probably trying to find some allies. No country wants to fight a war at two fronts, so I’d probably try to convince Andamar to be on my side, so if the Etrakien Empire attacks, Andamar would strike them in the back and force Etrakien to divide its forces. I continued in this way until I had gone through all the countries, and the result you can se above. As I’ve mentioned on the blog earlier I’ve started to play a simple and easy to understand roleplaying game with my two oldest children. 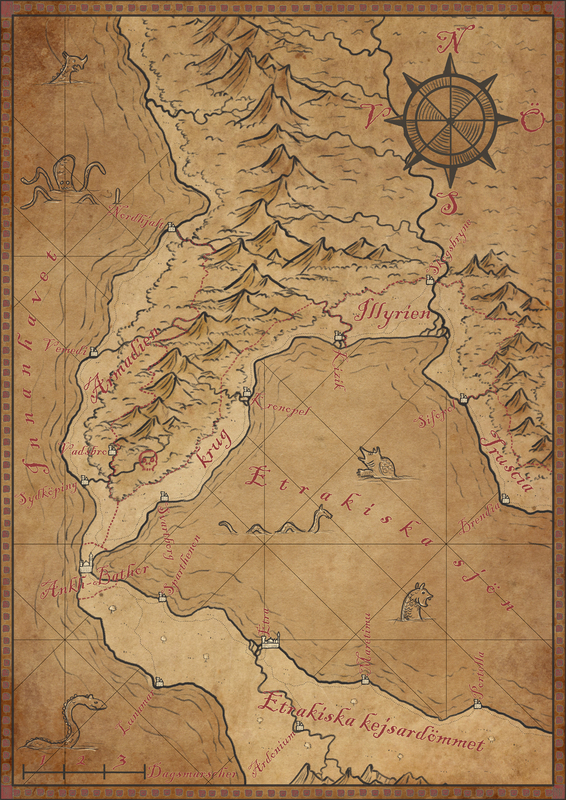 And of course no game can be really appreciated without a world map to look at. 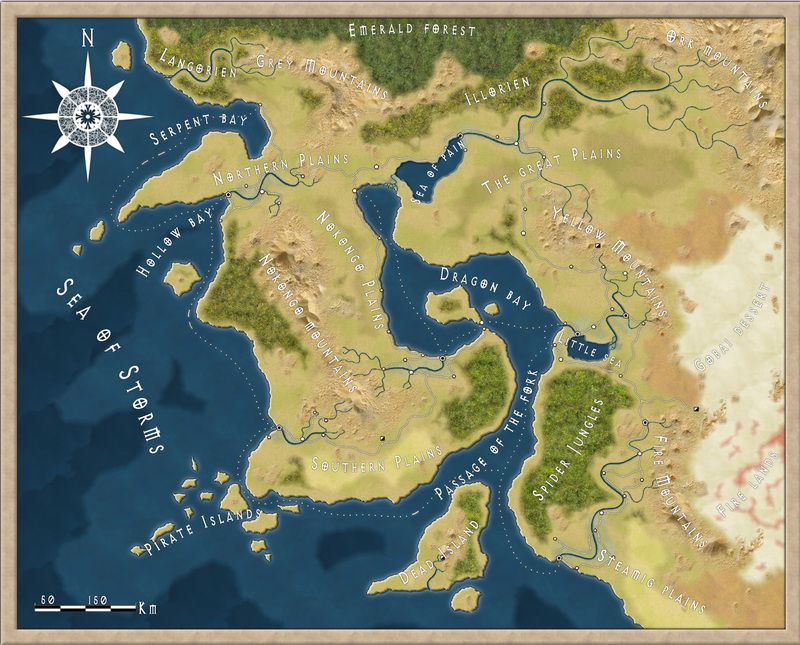 So I decided to make one while trying out the April annual style from Profantasy, made by the artist Herwin Wielink (Djekspek on Cartographers guild). It is always hard to start working with a new style, it takes a while just to get used to the style itself. What graphics are included, fields, desert, marshes, rivers, forests and so on. A good thing is to just create a couple of test maps to get used to the style, to get the feeling of it. In this case I did that, but not only on purpose. I’ve read on a lot of places that people complain that CC3 can be a bit unstable, that it sometimes crashes a lot. Well I’ve never experienced that, apart from with one of my more ambitious projects where the actual file grew too large for CC3 to handle. But with this particular style I actually had two crashes where I had to restart the whole project from the start again. That has never happened before, but I guess that the end result ended up better because of this. You can say that I learned from the mistakes in the two earlier maps, so I didn’t need to repeat them in the final map. The graphics in the style are absolutely gorgeous and mountains, forests and other symbols really melt into the background in a great way that kind of hides the fact that the map is made in CC3. The only other CC3 style I can think of that accomplishes this as good as this one is the 2011 March annual overland style by Jonathan Roberts. I also like the colour palette a lot in the style. Sometimes I think that maps made in CC3 can be bit cartoonish when it comes to colour, this particular style though has a really nice dark feeling about it. I like that. Overall the style was very easy to use, the selection of textures and symbols are vast so you can really get some great variation into the map. And variation is very good if you want to make a map that is unique and nice to look at. As usual I’ve done the labeling in Photoshop, I just can’t get it to work satisfactory in CC3, but that is probably because of me. The font is the same though as the one included in the style.